Community cats in the Midtown neighborhood have taken over and advocates say an organized community effort is needed to tackle the problem. While springtime typically invokes excitement for gardening, barbecues and perhaps a toss of the frisbee in the warming weather, in the Midtown neighborhood springtime is also kitten time and a reminder about who really rules the roost in this neighborhood’s outdoor spaces. Love them or hate them, most people living in the 700-block of Lyon Street (including this author) can agree - there are too many cats in the neighborhood. It’s not simply an issue of nuisance cats loitering around the neighborhood. The neighborhood itself has also become their de facto litter box, leaving many residents understandably frustrated. “I probably step in cat sh-t twice a month, three times a month. I don’t have an animal!” said an exasperated Mike David, a Lyon Street resident. David, a stagehand for local events and productions, works long shifts, sometimes as long as 18 to 20 hours a day. He said on several occasions, he’s tracked cat feces all the way through his house on the soles of his shoes without realizing it, leaving him with almost an hour of carpet scrubbing before he can go to sleep. Ace Williams, a resident of Innes Street who shares the same back alley with Lyon Street homeowners, keeps a special pair of boots outside and only goes out back occasionally because of the sheer volume of cat poop in his back yard. Walking barefoot through one’s lawn is also a thing of the past. Feral and stray cats have become such a contentious issue that simply feeding them pits neighbor against neighbor. Some argue against it, saying it attracts more cats; others say it’s needed to gain a cat’s trust so they can eventually take it to be fixed. “It’s almost like politics and religion. You don’t speak about those when you’re drinking and you don’t talk about feral cats in this neighborhood,” said one neighbor who asked not to be named. Bird lovers like Williams' wife also lament the cats’ tendency to kill their feathered friends, though there is a silver lining. “I haven’t caught a mouse or anything for probably a couple years - three or four years anyway,” Williams said. Residents said that’s about the time the alley’s population exploded. “A woman stopped by last week and said she no longer has a rodent problem thanks to the feral cats,” said Mark Stoddard, the president of Midtown Neighborhood Association. The woman even offered to help him with the cost of fixing neighborhood cats. Stoddard is one of the residents who actively traps and fixes alley cats - a practice commonly referred to as trap-neuter-return, or TNR. Since he moved to Lyon Street in 1992, he has spent countless hours and hundreds of dollars caring for the cats, getting them spayed or neutered and vaccinated, and finding good homes for the tame ones. The unadoptable, but fixed ferals are returned to the alley with their left ears tipped so that Stoddard and other volunteers can tell which cats have already been fixed. Though they remain outside, fixed ferals are less likely to exhibit nuisance behaviors like spraying and fighting because they are unable to reproduce. Despite his efforts, Stoddard said the population boomed out of control in 2010 and 2011 when a clever calico cat who avoided his traps mated with an owned, but unfixed male cat. Wild ferals and friendly strays, collectively called “community cats,” are especially prevalent in transitional neighborhoods with high turnover in rental properties, like Midtown, according to Manos. Uninformed first-time pet owners often adopt animals from friends or Craigslist without getting them fixed, leading to unwanted behaviors like male spraying and females caterwauling while in heat. Rather than dealing with the issue, they let the animal outdoors and a colony is born. Manos said unmaintained garages, abandoned structures and even covered grills provide those cats with the shelter they need to live and procreate, while rodents, birds and sympathetic neighbors provide the food they need. 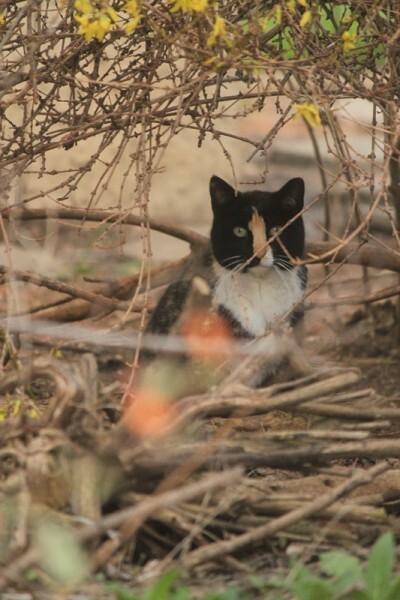 Though cat and kitten numbers in the city dropped significantly earlier this spring during a cold snap, Manos expects numbers will rebound as the summer heats up. 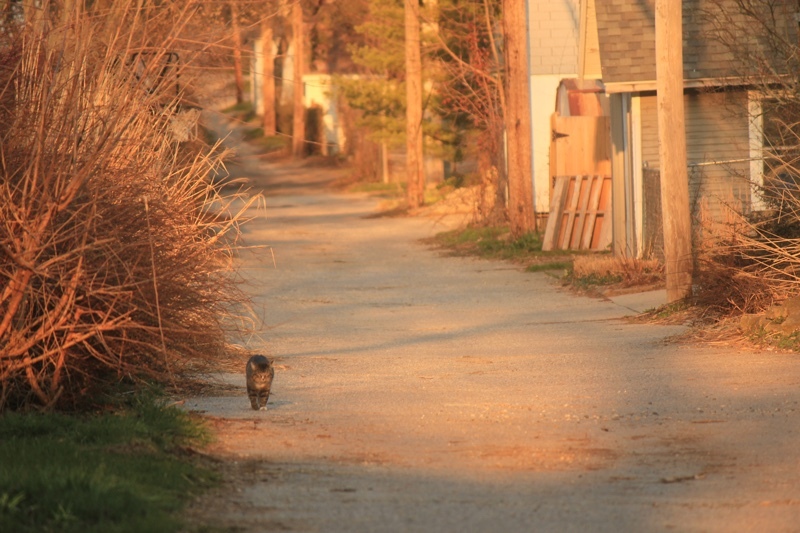 Lyon and Innes residents said that at the height of their population boom, as many as 30 cats could be seen together at one time in just their one alley. There are many other colonies in neighboring alleys and visitor cats are a common site. “It’s not just this neighborhood, so if you take care of this neighborhood, who’s gonna come in? Other kitties,” one neighbor said. That’s why advocates of trap-neuter-return like Carol Manos say their method is more effective than simply collecting and euthanizing the cats. “It prevents the vacuum effect,” she said. A big challenge to getting the population to a manageable size is the cost of spaying and neutering services and the time consuming nature of trapping and taking them to be fixed. Currently, the City of Grand Rapids and Kent County do not participate in trap-neuter-return programs, though Luttmann said the county is considering doing so in the future. That leaves the work largely to local nonprofits like Carol’s Ferals, which lends residents cat traps and can help them with the cost of surgery if they cannot afford it. Still, many people are leery of trapping the cats themselves or don’t have the time and even then, the cats can only be caught one at a time, making it a time-consuming endeavor. Furthermore, unless the efforts are coordinated with the residents living near neighboring cat colonies, new cats will simply move in to fill the void. Despite these challenges, Manos said Grand Rapids is “blessed” to have so many nonprofits devoted to community cats and has seen progress. Her organization alone has sterilized over 9,000 cats in the last decade and she believes colony populations will continue to decline as more residents and their communities join TNR efforts.